This page describes the 3-3 invasion that may occur after the 4-4 point diagonal attachment joseki. There are several 4-4 point diagonal attachment josekis, but they are all similar, so we shall simply use this particular sequence as the reference joseki. As noted in the 4-4 point diagonal attachment joseki page, the 4-4 point stone, and does not turn the corner into immediate territory, but leaves open the possibility of the 3-3 invasion at a. 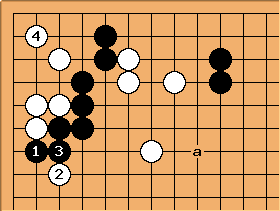 However, we shall see that while the White stones outside are weak, entering the 3-3 will give Black a very strong wall and allows Black to chase the outside White stones, making the invasion essentially an overplay. On the other hand, when the outside White stones become strong, the invasion at a becomes a real possibility. There are three common answers to the 3-3 invasion at . Black a induces a kind of splitting attack, suitable when the outside White stones are weak, as in the situation shown in this diagram. In this case, the invasion may be an overplay. Black b minimizes the loss in territory, but allows White to play at a next. 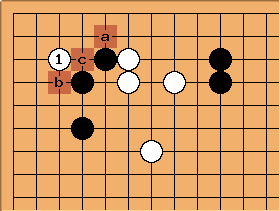 together with White a is very beneficial to the outside White stones' eye space, so b is suitable only when the outside White stones are already strong or alive. Black c is a compromise between the extremes of a and b. 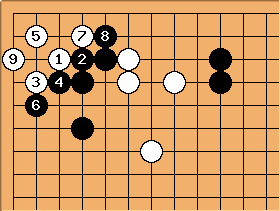 It is the case when Black does not want the White stones to connect up, and yet does not have an immediate strong attacking move. Note that the descent at reduces White's potential eye space around a. This is one of the typical josekis that can occur after the invasion at and the descent at . After , Black can look forward to an attack at, say, a. Black will decide how to continue on the left side later. Note that is also seen at b. 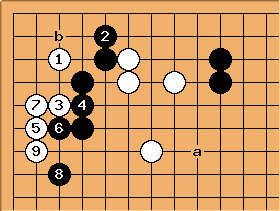 According to some Japanese books, White chooses this variation when White wants to live in the corner "tactfully", without getting the weak group on the outside into trouble. So when it actually occurs in professional play, one can expect that fighting considerations are already involved. 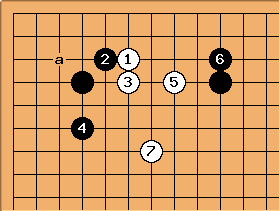 If blocks, White invariably plays kikashi with before answering in the corner at . Note that the Black stones on the left do not have eyes yet. This aditional aji provided by can assist White in settling the center stones. This is a second, but longer, joseki after . Note that is not at a. Again, Black has a very strong wall. 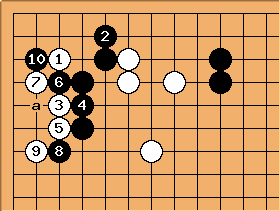 Because Black has firmly occupied the corner, Black's position is even stronger than the previous joseki. Just as before, the outside White stones are very vulnerable to an attack at, say, a.
NormanP: Before the 5-6 exchange, is black unconditionally alive in the corner? 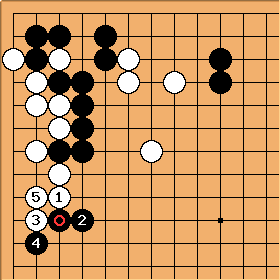 38 Basic Joseki says that he is alive without this exchange. 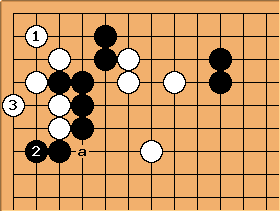 But it seems to me that a white play at 6 would deprive black of two eyes in the corner. In the present situation, black is very strong, so playing this way would not help white. But maybe white will build up strength in this area later in the game. Sverre: Black will answer 6 at 5, and even if White squeezes Black gets an eye at 6 and another to the right of 2. Assuming a typical position with an extension at , then a common White sequence is to settle his group with to . Hyperpapeterie Since Splitting Attack 2 gives up a fair bit in the corner, relative to Splitting Attack 1, and also reduces the chances for a counter-attack against Black's main group, I'm wondering what the compensation is, and when it should be played. 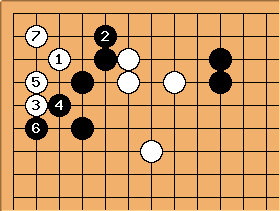 The two things I think I see are that the marked black stones are subject to an attack since they are cut off from the corner, and that if the marked white group is in trouble, the moves at a may be helpful since they threaten to connect. If that's right, are these considerations often sufficiently important to justify this variation? Another common variation is for above to play at here in the corner. 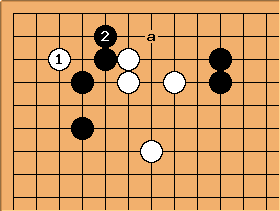 However, White is sealed in at the side, but Black has a cutting point at a which may need defending. The slide at is also sometimes seen. A typical joseki is up to . 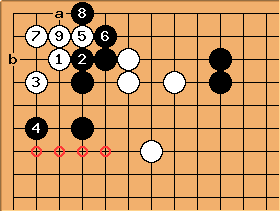 As mentioned, the block at minimizes the loss of territory in the corner and the side, but allows the hane at . With , White will find it very easy to make eyes around a. One of the josekis. 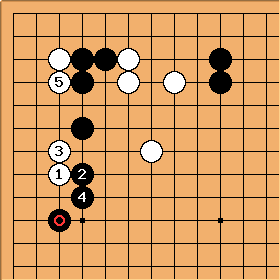 Black secures as much territory as possible. If here, then White can tenuki. 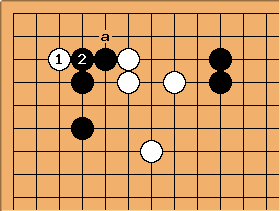 There are two follow-ups: White a, Black b, aiming for White c; or White d, Black a, White e.
According to Intermediate Level Power Builder Vol 1 when White is not yet secure, White should tenuki here rather than making the White a - Black b exchange because otherwise a peep by Black at d destroys White's eyespace. The good empty triangle at is a compromise. It does not allow White to get the hane at a, but leaves the corner open. 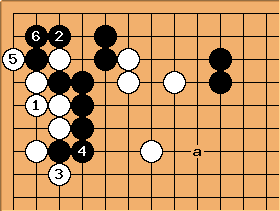 However, it is also not easy for White to immediately activate the stone. Therefore, it is usual for White to tenuki and treat the - exchange as a kikashi. siowy: How does White live when Black plays 'b'? Why are the marked spaces sente? Can someone show a specific sequence? This variation is also seen. In either case, the idea is to make it unpleasant for White to make life on a small scale in the corner. Therefore when Black plays the good empty triangle, White may choose to see the 3-3 move as a kikashi. 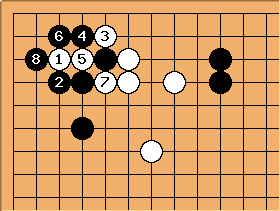 Assuming this typical position where Black has an extension at , White may aim for this sequence later, for making larger life or destroying the side area.